NATURAL HABITAT AND PREFERRED SITE: Cedar elm exists in the bulk of the eastern half of the state. It grows well in a wide range of soils including rocky limestone soils. It is drought tolerant but can stand a fair amount of moisture as well. 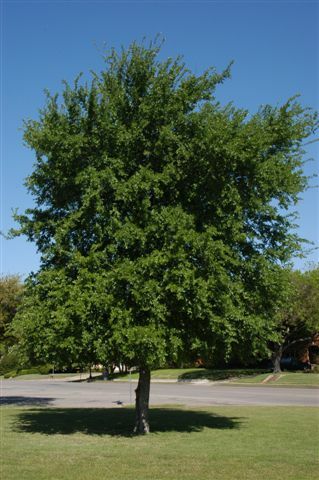 Cedar elm is native in all areas of Texas except the Trans Pecos High Plains and the Rolling Plains. 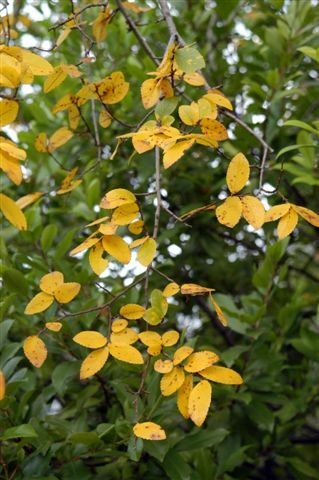 IDENTIFICATION INFORMATION: It is an upright growing tree with small leaves that are sandpaper-like in texture. 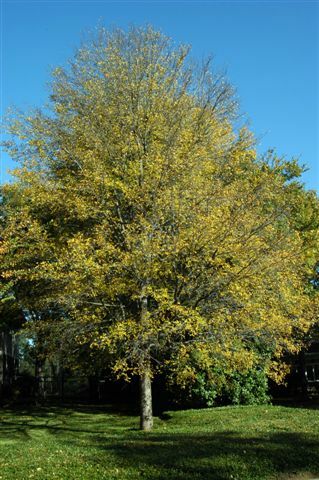 It has yellow fall color and produces its seed in the fall which is unusual for the native elms. FLOWERS AND FRUIT: Flowers form in late spring or early summer. They are small and unattractive. Fruit or samara that form in the late summer and fall are composed of a single seed surrounded by a wing. BARK: Brown to reddish or gray. Ridges are flat and then broken into narrow loose scales. It is a fairly smooth and fine textured bark. FOLIAGE: Simple, alternate and small 1 to 2 inch long, oval and sandpapery to the touch. Yellow fall color. CULTURE: Easy to grow in a wide range of soils. Needs moderate amounts of water and has low fertilizer requirements. It has moderate growth and some years rather spectacular golden yellow fall color. Although drought tolerant it is a tree that can stand fairly wet soil. PROBLEMS: Cedar elm will occasionally have insect pests such as aphids and minor elm leaf beetle damage. Mildew in the late summer has become its main imperfection which can be controlled to some degree with the Sick Tree Treatment. Mistletoe will attack cedar elms that are in stress and poor health. PROPAGATION: Cedar elm can be grown easily from seed. Collect the seed immediately after they mature in the late summer or fall, store over winter at 41 degrees before planting in the spring. INSIGHT: Cedar elm has been referred to as poor man’s live oak and has been over planted in the landscapes the last 3 decades. In recent years it has become more susceptible to mildew which discolors the foliage to a brown color in late summer. This malady may have something to do with the decline of air quality. Similar tree that is often confused with cedar elm is the winged elm - Ulmus alata which has larger and very obvious corky wings on the young branches and it flowers in the spring with its fruit maturing in early summer. Ulmus rubra or slippery elm has rough leaves as large as American elm and a slimy or slippery white inner bark that has been used medicinally. Also called red elm because of its reddish brown heartwood. It is faster growing than American elm and a little easier to transplant. Overall size is smaller but has the same vase like shape.